A few years ago I remember walking on the beach and finding pieces of plastic all over. I found plastic bags and it really broke my heart. Our precious lakes here full of these things. So I vowed then as a new mom to start to take tiny steps from there on out to change our footprint and the amount of plastic we use. Being a parent and talking about limiting plastic and our waste is nearly an oxymoron it can seem like especially when I first jumped into figuring out how to make this happen. I am by no means perfect. So I started to take the approach that every month is another chance to eliminate one more thing and find new ways all over again. I am constantly challenging the voice of convenience in my head to make room in my day-to-day to learn a new way. Life is all about challenging ourselves continually. That is where we grow after all. Moving around a lot I knew the easiest way to make an impact was to start with our grocery shopping and days at the market. So I started making strides in our weekly shopping trips to make this easiest to eliminate our waste (plastic use) and so on. 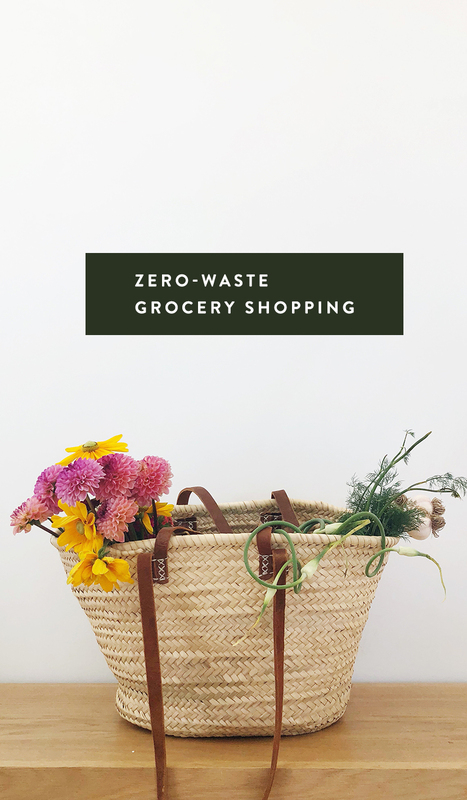 We weren’t perfect but we started small and now after almost 2 years we are nearly getting so close to zero to no waste with our grocery and farm market trips. We aren’t perfect every week but compared to a year ago we have changed so much!!! When I got the most serious was this last spring after we moved into our home and things felt more solid. I felt like I could find a routine and I had places to save everything more easily that I needed to make our trips simpler. I also focused on buying in more bulk as well so we used less packaging as well. We still have a little ways to go with prepackaged goods and are hoping to tackle that fully before the end of the year. The reason this has all been so important to us isn’t just because it is better for the environment but also because it literally isn’t an easy task to take care of our trash and recycling every week. We have no garage to store trash in and pay $5 for every bag we place at the end of our road that is just over 1/4 mile drive from our house. So we have to get everything into the truck and haul it down no matter the time of year. You can imagine in the dead of winter this a HUGE challenge. We wanted to first get to one bag a week and then our next now is to just 2 a month. Not only does it save us money, but it also is better for us and the environment. By the end of the year we hope to see 1 bag only a month if we can do it. For recycling, like many people in Leelanau County, you bring it to recycling centers and drop it off in receptacles. It is a service as part of our taxes, but it still is work to get it there. So making a point to simplify and lower the amount of what we get rid of has been a big deal. I would always rather opt for recyclable than trashable and single-use items. I found that groceries brought in so much trash! Especially after the last few months as we are eliminating single-use non-recyclable plastics. I also find that a lot of farmers and for us our Co-op are happy for you to clean and reuse containers and so on that they use. They many times will take them back to be used again. Things like egg cartons, berry containers, and more. If there are rubber bands on herbs or flowers, I keep them and never slice them off. They serve SOOO many good purposes in the kitchen so don’t toss them. That said, I wanted to share what I own that helps me stick to my routines with groceries and how I do it for you guys. These are things I use at both our co-op and local grocery store (that is similar to Trader Joe’s) and while at the Farmer’s Market. Mind you, We don’t often buy at large super grocery stores. It is very uncommon. Though I do go to Costco for things like Toilet Paper, Laundry Detergents, and a few other items from time to time (I have a story highlight about some of the things I buy at Costco and why on my Instagram if you want to watch). I am trying to figure out the best balance with a place like that because I think there are pluses but there is a lot of single-use going on that I am working to eliminate every month little by little (basically one product at a time). I always look for containers that are recyclable, but many times there are small single-use plastics involved with them still. So I am always looking to do something that might either make it simpler to make that product myself with less waste or find a way to eliminate it from our lives. Okay so here are the things I use for our trips to the market. Mind you I purchased things or asked for things for gifts over almost 2 years so just remember that. I do not think you have to invest big up front at all. Make a lifestyle change and let it become comfortable and normal till it sticks. I found these ones on Etsy which is great, but you can find some on Amazon as well. The best part is most Etsy vendors will also send them to you without any packaging that is single-use if you request it as well. I just make sure my bags are organic cotton because I don’t want to put my organic veggies into something that isn’t organic as well. This isn’t the one I use. I actually got one from a friend who didn’t want her’s anymore and now it is in my car all the time. I love it because it either keeps veggies in my car protected on REALLY cold days in the car or keeps my dairy and milk products or refrigerated things cool on hot days especially if I have a lot of errands I am running. These are my dream bags and not the ones I have. I just have totes that I have collected over time that I use. They aren’t pretty, but they work and get the job done. I love that I have so much less to deal with when I come home too. I just stuff them all back in together and then take them back to the car and set them in the front seat so I never forget. This is my go-to for market trips. I also have a backpack I take on really busy days I know I want to load up especially in September when I am freezing and preserving. This guy is awesome, strong, and holds a lot. I love it and my mother in law got the one I use for me, but this one is on Etsy. Mur Lifestyle also has some different styles as well. You don’t have to use these but I do because they can seal well. There is a discussion about these being better than regular plastics on the earth or not. Either way, I use them over and over for spices and other things because they zip up tight and are easy to pour out spices into containers. I just wash them and let them dry over and over again. When they start seeing the last of their life I let them go, but I figure it is better than the alternative which is the tiny plastic bags at the co-op. These are new ones I just got. I found that the Muslin were great for kale and other large things or rices and so on, but these guys are great for apples, pears, tomatoes, and so on. It makes it easy on the person that is checking you out. This is especially true at grocery stores that aren’t use to people bringing their own produce bags. I find I get so many nasty looks at larger stores when I request to use my own things and it slows their process down. This is awesome for hauling potatoes and other really dirty veggies. The dirt slips through and I think they are just pretty too! Since I shop mostly for bulk dry goods at our Co-op (most high-end grocery stores and Whole Foods have these sections) I either reuse bags or I use my produce bags. Just secure them well in your bags. Our co-op uses plastic recyclable containers for their bulk goods as well as the containers as well, so I will just reuse them over and over and then eventually recycle them after about 4-5 uses. They are happy and actually consider that for making donations (aka the incentive they use for people to reuse bags and so on). I use my produce bags there as well. If you shop in a large grocery store chain you may think about getting see-through or mesh style bags so your checkout person scoffs about it less. But I use these bags constantly and just wash them. Now when I get home from the store, I store everything in either in the veggie chiller or in glass containers so it stays fresh longer. I place all dry goods in their jars in the pantry and then replace all bags back in my grocery bags I have. If they need washing I do that, but usually that is pretty minimal since they are used for such a short time. If there any plastic bags I have acquired I rinse them and let them dry and then add them into my bag. I usually end up with 3-4 a season that need to be tossed or are just falling apart. I hope to eliminate more and more. One thing that can be a challenge is spices. Buying them in bulk is the best way, but they are hard to transport without plastic bags. This is where I will reuse the plastic bags often. I have glass labeled containers they all go back in, but I use plastic bags from the co-op and just reuse them. I do the same with bulk flour and salt as well. Seriously I realize our co-op is unreal and we are very lucky to have it. Oryana. I love you! My final note here is that, I do not believe plastic is completely bad. I think there is a use and purpose for it. In fac,t my brother is a Plastics Engineer for a major Car Manufacturer in the country. I believe in the power of plastic, but I think how we use it in our lives is the awareness we nees to be focused. Single-use and just throwing it away very easily isn’t the answer. We need to think about where it goes, how it is handled, how long it sits, and the impact it has on our health and environment. Some of these products contain plastic, but it is okay to me because we are using it with intention and purpose. All about balance and awareness. I plan to do another food storage post on how we have eliminated plastic in our kitchen when storing our foods. Then I also will do one about how we are eliminating single-use plastics from crackers, snacks, etc. as well by the end of the year as well. Lots more will be had about this conversation, but remember this, I am not perfect!!! I every day take little tiny steps forward in this fight. I don’t bite it all off at once. Focus on awareness first and foremost before we take any big step. Look at what you throw out with new eyes and figure out where you can start with one change and then another. Little by little let things stick and change your lifestyle. That’s the most important thing! Thank you for this post. Some of these ideas i can incorporate and some not. 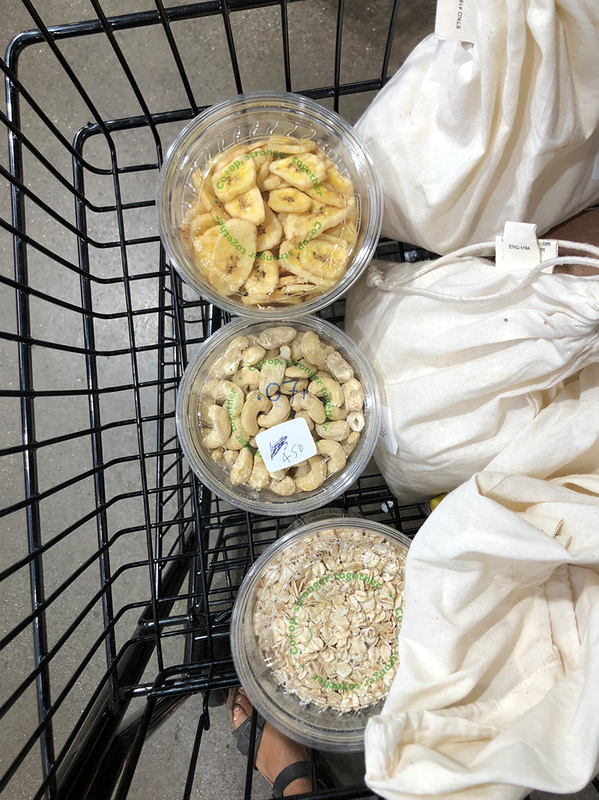 Our health/bulk foods store uses plastic bags for bulk and will not allow us to bring our own containers. I hadn’t thought of just reusing their bags until i can’t anymore. would love to see you post about single use containers. I have a teen who is at school and practice all day and needs lots of food (lol) with him. 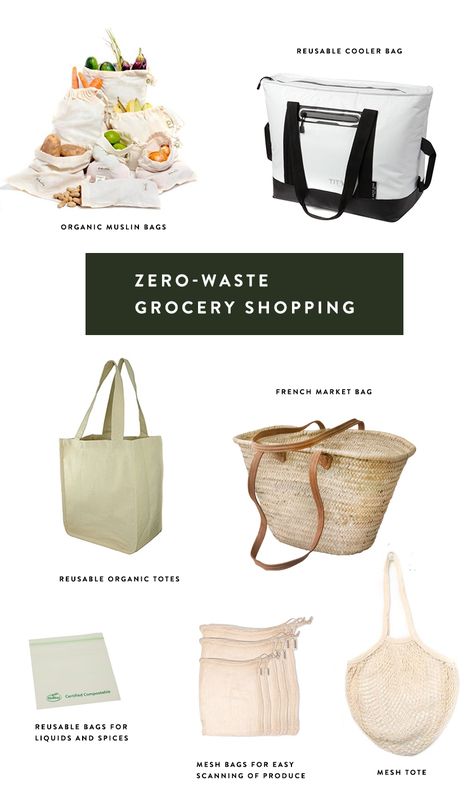 i love that zero-waste changes are gaining more awareness. i think a lot of people see it as a daunting change at first so i am hoping that posts like this will help people see that little changes can make a big impact on the planet! i hear you about big grocery stores, i definitely have figured out which cashiers appreciate my choices and I make a beeline to them every time. but Spices are tricky for me too, i am looking into reusable SILICONE SANDWICH snack bags or small nylon ones. I haven’t found an option i love yet. so like you, I am reusing the plastic bags at the store. Love this! we are trying to take these steps too! our biggest downfall are the weeks we are busy and don’t cook–carryout it is. so much waste there 🙁 but i love seeing others taking steps and offering advice and sources to continue the journey! thanks for sharing. I love the environment too!!! Stores near me has eliminated the use of plastic for sales…. I’m really interested on this and Loved this post! we’re taking little steps too at home (living in the other side of the pond: Catalonia). 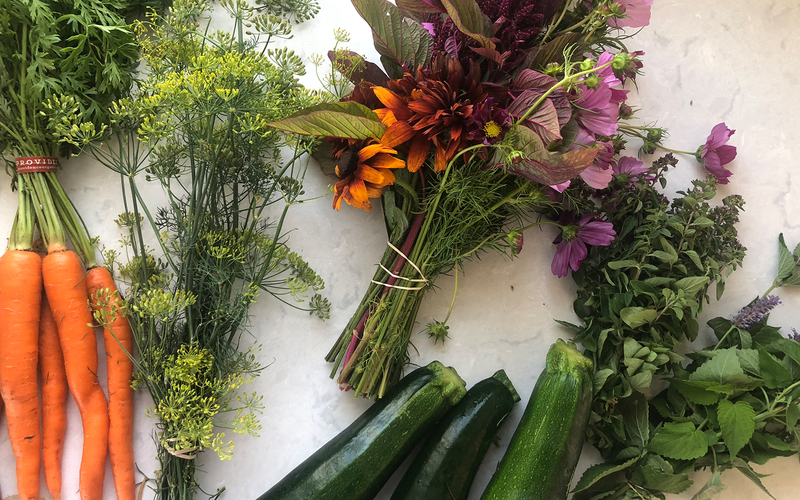 So looking forward to read this post you plan about how you have eliminated plastic in your kitchen when storing and eliminating single-use plastics as well. Thank you! These tips are great! As a college student these would be super helpful. They would save money and make sure im eating healthy and not buying junk. I will definitely try to incorporate some of these practices in my college grocery shopping because i think they would change my habits a lot.